We've gathered as many of the winners' names as we could here...bloggers, if you're not on this list, leave a comment with your winner info! Wendy *this is a Wendy with no blog, we can't find you! Congrats to the winners....the winner on my blog was LadyDoc...check out my blog at Lone Pine Designs for details. Congrats to everyone who won a prize - the winner's on my Blog, Scrappily Ever After, were Christy Sheffield (Cosmo Cricket Gift Pack), Dixie Cochran (3 sets of digi stamps from The Cutting Cafe), and two of my followers Lil and Tracy4 (won a small goodie from me). I have recieved addresses, etc. from all. What a great blog hop this was! Thanks to OWH for all the hard work. Congrats to all the winners! Both my winners on Rose Blossom Legacies(Kim and Anita) were notified, and their goodies were sent!! WooHoo, congrats to the winners. 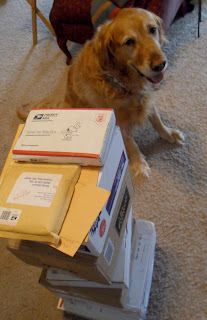 The winner on my blog was Bev E.
Congratulations to all the Blog Hop prize winners! I have a winner on my blog that I haven't been able to connect with. If you recognize your name or the snippet of your comment I'd love to send your prize out! My blog candy winner was Christine of Christine's Crafting Capers and I've already been in touch with her! Congrats to all the winners! congratulations to everyone. I am sad i didn't get anything. :( there is still time to enter my Blog Candy if you haven't done so. I will pick and announce a winner this coming Saturday. :) Good luck everyone! WoooHooo! Congrats to all of the lucky winners! Thanks to the winners of my blog candy at Stamping With Grandmalee for getting back with your details so quickly. I'm also loving it that I won some of the cardstock! WOW! I'm going to have enough supplies for my upcoming card party for sure!!!! Thanks also go to the company that was kind enough to donate all of this! Also thanks to Sandy whose car may never be the same from hauling these boxes all around! THANKS! Ooh, I see my name! I had no idea. I'm all excited now. :) How do I claim my prize? TEREZA---U DID WIN MY BLOG CANDY, I AM TRYING TO FIND YOU I LEFT MESSAGES ON YOUR BLOG AND ON THE FACEBOOK PAGE...CONTACT ME..
My winner on "What's Next" is Celeste L. Package is on the way! Congrats to the winners posted!! I can NOT draw my winners yet as I have a handful of people unidentified. My main blog hop candy is for hop participants only but then i am giving 6 x 9 envies crafty stuff to 3 non-participants. so I MUST know everyone, to be able to place names in the right "hat". I sent an email to Karen for some help. I figured out one person on my own, and I have the Wendy that is listed above also(I am guessing it is the same gal) no blog etc. My plan was to draw the names after 9pm on Monday and list the winners on Tuesday and it is now Friday. I am getting a bit frustrated so...I will also list the names here...if I can not identify these people by Saturday night 6PM...I will start putting the names in hats without them, and draw a winner and then the other winners. Congrats to all the winners - I have contacted the winner of my blog candy - Brenda H - and she has sent me her address info. Just drew my winner... drum roll please... it's Katerine of My Magical Inky Tour.... Congrats! The winner of the Express the Moment sponsored Card Kit is Christine, from Christine's Crafting Capers! Congrats Christine and thank you to Kim at ETM for sponsoring with the card kit - hooray!